SAN FRANCISCO (AP) — The smartphone industry has been searching for a breakthrough to revive a market mired in an innovation lull and a sales slump. There's now a potential catalyst on the horizon. Samsung and several rivals are preparing to roll out new redesigned devices with flexible screens that can be folded in half without breaking. That feat could make the devices more versatile for work and pleasure, by increasing screen space to the size of a mini-tablet and fold like a wallet so they can revert to the size of regular phones. "Everyone has been thinking about the same question: 'What's next? Is there nothing more from a smartphone?'" 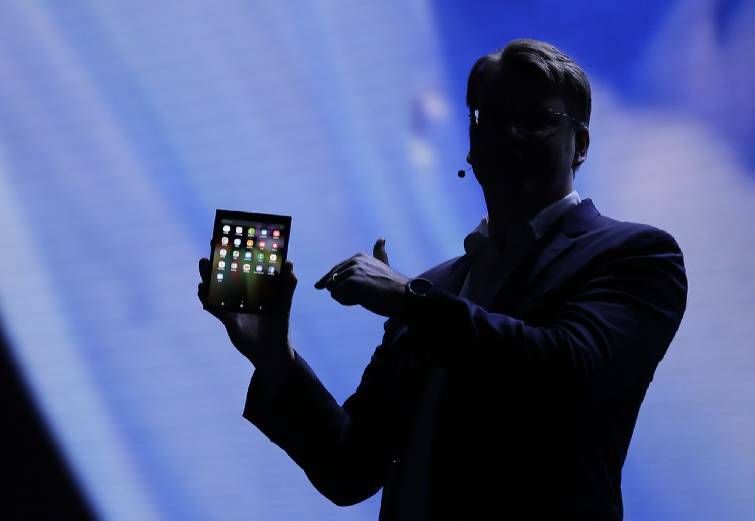 said Bill Liu, CEO of Royole Corp., a small Silicon Valley company that unveiled a foldable-screen phone last week in China, where it will go on sale next month. The concept of foldable-screen phones is about to get much broader exposure now that Samsung appears finally ready to release one. In an indication of how difficult it is to make a flexible screen that's also durable, Samsung first announced its plans to build a folding-screen phone five years ago. It wasn't until Wednesday, though, that Samsung finally provided a glimpse at what it's been working on. "We have been living in a world where the size of a screen could only be as large as the device itself," said Justin Denison, Samsung's senior vice president of mobile product marketing. "We have just entered a new dimension." Except for a fleeting look at a device he held in a hand, Denison provided scant information about the phone. Samsung says it will be ready to hit the market at some point next year. It's not even clear whether flexible-screen phones will have mass appeal, especially when the bendy devices are expected to cost more than $1,000. Royole, for instance, has expects to sell its foldable-screen phone — the FlexPai — for $1,300 to $1,500 once it comes to the U.S. — something that won't happen until next year, at the earliest.